Before scoring your essay, review the unedited text of the following six essays written by students in response to the same topic. Rate each one on a scale of 6 (high) to 1 (low), and write a comment about your impressions in the spaces provided. (Give a 0 to any essay not on the assigned topic.) Then compare your comments with those of two SAT evaluators. Finally, after rereading and scoring your own essay using the Self-Scoring Guide, find an informed and impartial reader to give your essay a second evaluation. The original essays were written by hand, but these have been typed exactly as written. Students should earn grades which reflect their achievement. There are many students who work hard, yet do not receive high grades. However, if they are unable to retain the knowledge they have been taught, then they should receive the grade they deserve. If the system were to change and every student who tried hard received a high grade, how would we differentiate between those who are truly gifted and those who merely make an effort? This is especially important in high school and college, where intelligence matters a lot. I, for one, would not want to go to a dentist or a doctor who got good grades in dental or medical school because they tried hard. I would want the best there is to take care of me. In younger years of schooling, on the other hand, effort should be given some credit, but as junior high approaches, students should be divided by ability. This division should be made apparent within their grades. The system of high grades for achievement should apply in every academic subject. When electives are involved, a different process could be used. If someone is not artistic or athletic, but tries hard, they should be awarded a grade for effort. However, their artistic and athletic classmates should be awarded a grade for ability. If we were to change this efficient system, the determination of placement of all students would be disrupted. *Remember: Since this is an eBook, please record all of your impressions about the essay separately. Comment to Jan: Your essay addresses the topic directly with a concise and forceful opening statement: “Students should earn grades which reflect their achievement.” Yet, you avoid being dogmatic about it by thoughtfully considering the use of different grading criteria at different stages of education. Especially in the first paragraph, you back up your opinions with interesting and specific supporting material. Your reference to doctors and dentists is particularly apt. Throughout the essay you maintain a consistent point of view and organize your ideas logically. Sentences are varied and generally well-structured. Some imprecise language and awkward wording (e.g., “younger years of schooling,” “the determination of placement”) plus an enigmatic concluding sentence take away from the overall quality of the piece. Each reader gave the essay a score of 5, for a total score of 10. I feel that the issue here and where I stand depends on a lot. For example, I think it depends on what kind of student you are what kind of classes you are in and if you’re an all around prepared student. Your grade realy depends on what kind of person you are. If your lazy and take everything as a joke. Never hand in work. Late a lot. Fail tests, then that’s the grade you deserve. If you re all around prepared student and you really try hard you should give someone high grades. I have had this experience in high school I have tried hard but have not achieved a lot though my effort. In Math Class I had in 9th Grade but I didn’t do so good so Summer School here I come. I did better on it. I think that during summer school I set a goal for myself and the teacher helped me. That’s why I did good I think if people set a goal for themselves they would try even in any subject. Comment to Philippe: The error-filled usage and confusing presentation of ideas suggest that you have severe problems with basic English expression. Your writing suggests that English may be your second language. Including a personal anecdote about your math class supports your point of view and indicates that you have learned a worthwhile writing technique that should serve you well on future essays. Numerous problems in the essay point to a need for remedial work in writing before you attend college. Each reader gave the essay a score of 1, for a total score of 2. Ever since there were schools there has been controversy over grades, because grades in school in some ways determine the course of your life. Which is more important, achievement or effort? In which situations is one more important than the other? I believe that a student who works very hard in a very difficult course, but doesn’t quite make it into the 90 range, should be rewarded for their effort. On the other hand, a student who is naturally gifted in the area of the hard course and achieves say a 95 test average with little or no work, should remain with their test grades for their final average. As must be evident to any one, a child in elementary school should be graded differently than a student at Harvard Law. Effort should be regarded as the basis for grading of a very young student, because grades K–6 are crucial years when children must be shown the importance of effort. Students at Harvard Law are different. They should be graded with emphasis on achievement rather than effort, because trying hard doesn’t matter if when they go out into the real law world, their effort is not irrelevant. If they don’t win the case, no one cares about how hard they worked. It is ridiculous to expect that we can use the same basis for everyone in the educational world. Everyone is an individual and should be treated like one. Comment to Johnny: You open your essay with an unnecessarily broad and pointless generalization about grades. Then you ask a couple of questions that suggest you are still searching for an idea to write about. The second paragraph, which might have served as a respectable opening paragraph, is more direct. It contains a strong topic sentence, but its development could be clearer and more economical. The remainder of the essay consists of vivid examples to support your main idea. Sentences are varied and occasionally highly effective. In the third paragraph the terse statement “Students at Harvard Law are different” contrasts nicely with the longer, more diffuse sentences that precede and follow it. The concluding idea, however, is not totally justified by the content of your essay. Overall, though, the essay attests to a measure of your promise as a writer. Each reader gave the essay a score of 4, for a total score of 8. The majority of students work their butts off in school. I believe they deserve high grades for their effort. If a student does’nt work hard and does’nt make an effort I believe that student deserves a low grade. If they like a certain subject they tend to make an effort and do well in the class. This type of student deserves a high grade. If the subject is disliked, the student still should strive and make an effort. They could have an attitude problem. If this student does badly, even if they try their best, I believe they deserve a high grade anyway. If a student is behind in their educational careers, it does not make any difference. If this type of student tries hard they should receive a high grade. People who don’t work hard normally get low grades anyway. Grades are not very important for this type of student. All they want is to graduate. They don’t go to college. They are usually at the bottom of the class academicly, studying is the last thing they do. If they apply for a job, their employers won’t ask to see their transcript All they want to know about the student is if they passed and got a diploma. Comment to Gavin: Your essay, which focuses on the issue of grades and effort, takes into account the different needs of certain types of students. Although it’s not always easy to follow your train of thought, you have clearly attempted to develop some of your ideas about grades and effort. Expression is awkward, however, and the repeated use of sentences beginning with “If” suggests a limited awareness of sentence variety. In a few places, the essay suffers from incoherence, and throughout, it demonstrates little mastery of basic English usage, especially in the proper use of pronouns. Each reader gave the essay a score of 3, for a total score of 6. Comment to Tad: Your essay starts well and contains some interesting, although awkwardly worded, ideas about grades and effort. The examples you present to support your view are not altogether clear or effective. Toward the end of the essay, the point is lost in a puzzling array of quotation marks and a hard-to-follow structure. Had you written more than one paragraph, the meaning of the essay might have been more transparent. Karen Greene (the teacher named in the essay question) faces an atypical dilemma. So many teachers today (my mother, for example) say they are unable to choose between achievement and effort to determine their students’ grades. The reason is that testing has become the main emphasis in the curriculum in many schools, making student effort irrelevant. When a student doesn’t do well on tests, their grade must be low regardless of the amount of effort they make. The current trend in education is a pursuit for high test scores. The media regularly reports reading and math test scores of students at all levels, but also history, geography, and science. When test results go up, educators, parents, and school administrators rejoice. When scores decline, it’s crisis time. Teachers are called incompetent, administrators lose their jobs, state education departments threaten to close schools, and parents demand the creation of new charter schools for their children. As evidence of important of high scores on tests, Atlanta, Georgia is an example. After recent statewide tests the city’s school superintendent, many teachers, and principals were accused of changing answers on student’s multiple-choice answer sheets. The schools were under so much pressure to earn high scores that the staff resorted to cheating. They didn’t care whether their students could read well or do math. Their only concern was high test scores and creating an image of a high performing school system. While they wouldn’t go as far as to support cheating, many people say that achievement should be the most important factor in evaluating education. They use as an example a doctor who tries hard but is not skillful in the practice of medicine. Nobody would go to such a doctor. That argument has some validity, but I think that grading students should not be an either-or situation. A balance is better. Comment to Tiffany: Your essay begins with the bold and perceptive comment that the essay question, in the context of present-day educational priorities, is flawed. You then provide compelling evidence, via an account of the recent scandal in Atlanta, to support your view that the quest for high test scores has caused a loss of perspective on what is educationally important. You also provide evidence, using the example of the incompetent physician, to illustrate the opposite—the inherent absurdity of rewarding effort alone. Having pointed out the defects of determining grades by relying solely on test scores or solely on effort, you demonstrate a high level of critical thinking by declaring that grading should not be “an either-or situation.” As you say, a “balance is better.” Indeed, by discussing both sides of the issue, your essay itself contains such a balance, supported by your essay’s last paragraph in which you offer a real-life example of your essay’s main point—that grades should be based on a variety of criteria. Your essay is well organized. It consists of a coherent progression of thought and contains ample support of your main idea. Its diction is mostly appropriate, and its sentence structure is sufficiently varied. Except for a few careless constructions (e.g, “As evidence of important of high scores… .”) and some grammatical flaws, the essay displays a notable degree of competency in writing. Each reader gave the essay a score of 6, for a total score of 12. Using this guide, rate your essay in each of these six categories. 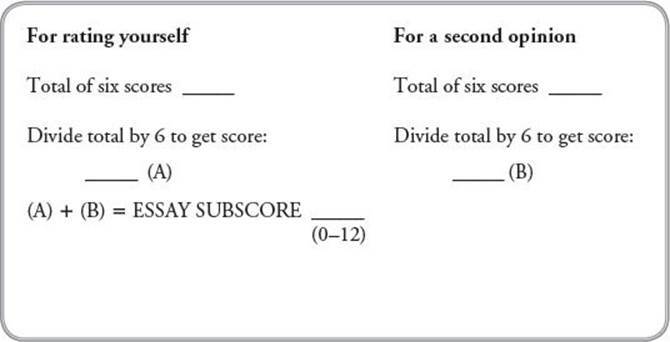 Enter your scores in the spaces provided, and calculate the average of the six ratings to determine your final score. On the SAT itself, two readers will score your essay on a scale of 6 (high) to 1 (low), or zero if the essay fails to respond to the assignment. The score will be reported to you as the sum of the two ratings, from 12 (best) to 2 (worst). Because it’s difficult to read your own essay with objectivity, you might improve the validity of your score by asking an informed friend or teacher to serve as a second reader. Or better, recruit two different readers to evaluate your essay. Remember, too, that SAT readers ordinarily evaluate essays in relation to other essays written on the same topic at the same time. Because you are judging your own essay apart from others, this guide may not yield a totally accurate prediction of the score you might earn on the exam.